Another coup plot by the United States government, with a sitting president and vice president leading it. On February 12, Venezuelan President Nicolas Maduro announced Obama’s plot to kill him, oust his government, and seize power forcefully was thwarted. More on this below. Throughout his tenure, Obama waged war on humanity. It continues against free people everywhere. His deplorable record might make some despots blush. He viciously targets fundamental freedoms at home and abroad. Governs under a police state apparatus. Unilaterally decides who lives, dies, stays free or is imprisoned. He continues waging war on Afghanistan after pledging to end it during his first year in office. No end of conflict looms. Permanent war and occupation is planned. Afghanistan is a wasteland of dystopian misery. Obama ravaged and destroyed Libya. Turning North Africa’s most developed country into an out-of-control cauldron of violence. Its people stripped of all social benefits and rights Gaddafi provided. In June 2009, he orchestrated Honduran President Manuel Zelaya’s ouster. A US supported fascist despot replaced him. After Haiti’s devastating January 2010 earthquake, Obama militarized the country, plunders it freely, exploits its people ruthlessly, orchestrated rigged elections, and prohibits democratic governance. In September 2010, his attempt to topple Ecuador’s Rafael Correa failed. In 2012, he orchestrated Paraguayan President Fernando Lugo’s ouster by rigged parliamentary impeachment. In February 2011, he manipulated Egypt’s Hosni Mubarak’s removal. So-called Arab spring was more mirage than real. In July 2013, Mohamed Morsi’s toppling followed. Obama’s dirty hands conspired with Egypt’s General Abdul Fatah al-Sisi to install junta rule. In February 2014, He ousted Ukraine’s democratically elected government. Put neo-Nazi putschists in charge. Uses them to wage war on their own people. So-called February 12 Minsk resolution is pure fantasy. No end of conflict looms. Peace is a convenient illusion. So is democracy. America tolerates none at home or abroad. Throughout Chavez’s tenure as Venezuela’s president, Washington went all-out to oust him. Obama succeeded by killing him. He wants fascist rule replacing Maduro. Bolivarian social justice ended. Predatory capitalism replacing it. He’s waging relentless economic and political war. A previous article discussed Maduro accusing Vice President Joe Biden of directing efforts to oust him. Likely kill him. On February 2, he said, “(t)he northern imperial power has entered a dangerous phase of desperation, going to talk to the continent’s governments to announce the overthrow of my government. And I accuse Vice-president Joe Biden of this” plot. He called Washington’s plot no ordinary crisis. He appealed to Venezuelans to remain on high alert against “a bloody coup underway” against everything Bolivarianism represents. In a televised Thursday address, he announced a US-instigated foiled coup plot. Civilians and military members were involved. They were arrested. They remain detained. They’re connected to four Venezuelan air force generals involved in a 2014 plot to oust Maduro. A State Department spokesperson declined to comment. National Assembly President Diosdado Cabello explained details of Obama’s plot. Scheduled on the anniversary of the start of last year’s US-orchestrated street violence. Plans included killing people during marches and demonstrations. Installing “transitional” governance would follow. Opposition legislator Julio Borges was accused of choosing locations to be attacked. Cabello said authorities seized grenades, military and Sebin (intelligence) uniforms, and a video coup plot declaration by masked military officials displaying deadly AR15 rifles. Automatic versions can fire 800 rounds per minute. Semi-automatic ones are widely available in America. Venezuelan civilians are prohibited from owning them. “Venezuela has a very violent sector of the opposition that doesn’t hesitate to plan actions that could mean dozens of deaths or the assassination of the president,” said Rodriguez. Cabello said Borges and opposition leader Antonio Ledezma planned to announce the coup publicly. Sign it. Then have corporate controlled anti-Bolivarian national media publish it. Maduro said one suspect arrested was under surveillance since last year’s street violence. He and others continued plotting to oust Venezuela’s government. With considerable help from Washington. A four-stage plan was hatched. Including economic and political war. Inventing a nonexistent humanitarian crisis. A political coup. Followed by a military one installing transitional governance. 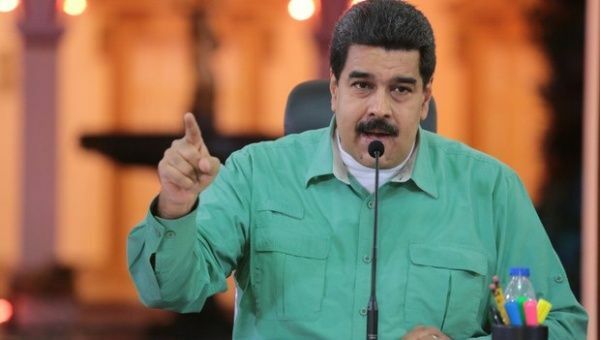 Maduro said the plot was discovered after military officials approached to participate reported the scheme to civilian authorities. On Thursday, Maduro urged Venezuelans to remain on alert. Prepare to counter US-directed fascist attempts to seize power forcefully, he said. Families of victims of last year’s fascist street violence want everyone to know hard truths about what happened. Washington’s orchestrated right-wing rampage left 43 dead. Hundreds of others injured. A deadly repeat looms. Obama wants Venezuela looking like Ukraine. He wants its democratic governance destroyed. Its valued energy resources plundered. Its people exploited. Venezuelans want the whole world to know what happened last year. What’s planned against their country. According to a committee representing families of victims of last year’s violence, perpetrators blamed government authorities for their crimes. “That’s why, we have decided to demand that the events be investigated and the truth determined, about who was intellectually and materially responsible for these human rights violations, and what their real motivations were,” they said. The day after Maduro’s April 2013 election, opposition candidate Henrique Capriles called on supporters to rage (arrechera) in the streets. Weeks of violence, deaths and destruction followed selectively in middle and upscale neighborhoods. The vast majority of Venezuelans opposed it. They still do. Obama continues going all-out to crush Bolivarianism once and for all. To return Venezuela to its bad old days. To restore dark side rule. Millions of Venezuelans are a bulwark against him. Obama’s failed scheme is Washington’s latest attempt to replace Venezuelan democracy with fascist rule. Expect more of the same ahead. Expect Obama to keep menacing humanity throughout his remaining months in office. Stephen Lendman lives in Chicago. He can be reached at lendmanstephen@sbcglobal.net . His new book as editor and contributor is titled “Flashpoint in Ukraine: US Drive for Hegemony Risks WW III.” http://www.claritypress.com/LendmanIII.html Visit his blog site at sjlendman.blogspot.com. Listen to cutting-edge discussions with distinguished guests on the Progressive Radio News Hour on the Progressive Radio Network. It airs three times weekly: live on Sundays at 1PM Central time plus two prerecorded archived programs.